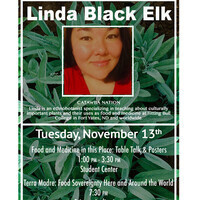 Linda Black Elk is an ethnobotanist and science education instructor at Sitting Bull College on the Standing Rock Reservation in North Dakota and a member of the Catawba Nation. She specializes in teaching about culturally important plants and their uses as food and medicine. Linda's visit is coordinated by the University of Minnesota Morris Native American Student Success program with support from the U.S. Department of Education Title III Native American Serving Non-Tribal Institutions program and UMN Morris staff, faculty, and student collaborators with support from the University of Minnesota Institue for Advanced Studies. Free admission. No ticket required.